Imagine yourself relaxing early morning or evening and taking in the Panoramic Sunrise and Sunset from all the balcony of this 2nd floor Beachfront condo at Edgewater Beach Resort. While away the time - on the beach, playing golf, or take part in many of the varied activities this Pretigious Complex has to offer. FREE Wi Fi too! Located Right on the Beach! Bedroom features a king bed, large closets. Two Full Baths and convenience of washer/dryer in the condo. Living room features queen sofa sleeper, love seat, dining room area. Full kitchen. Recently redecorated. Complex offers 11 swimming pools, 10 Plixicushion tennis courts, hot tubs, game room, restaurant, gift shop, small market place, pizza place, Tiki screen printing, Splash Pad, Rope course, Par 3-9 hole Golf Course and a tram service to get you to anywhere on the property. All rooms of this lovely, up to date condo have beach view with patio doors from living room and bedroom to access balcony. In the Heart of all Panama City Beach has to offer. Just a short walk or driving distance to everything. Come enjoy! You'll wish you could vacation forever! Some of our favorite near by restaurants include: Firefly, Boar's Head, Mike's Diner, Wicked Wheel, Pineapple Willie's, Montego Bay to name a few. PCB offers family attractions such as: Zoo World, Gulf World, Shipwreck Island water park, Wonder Works, mini-golf, water sports, Bike and boat rentals and the list goes on and on. We have been coming to PCB for several years because we love the gulf. Edgewater Beach Resort has everything so we don't even have to leave the resort area. There are so many amenities not offered by the other condo complexes in the area. And, everything is close-by. 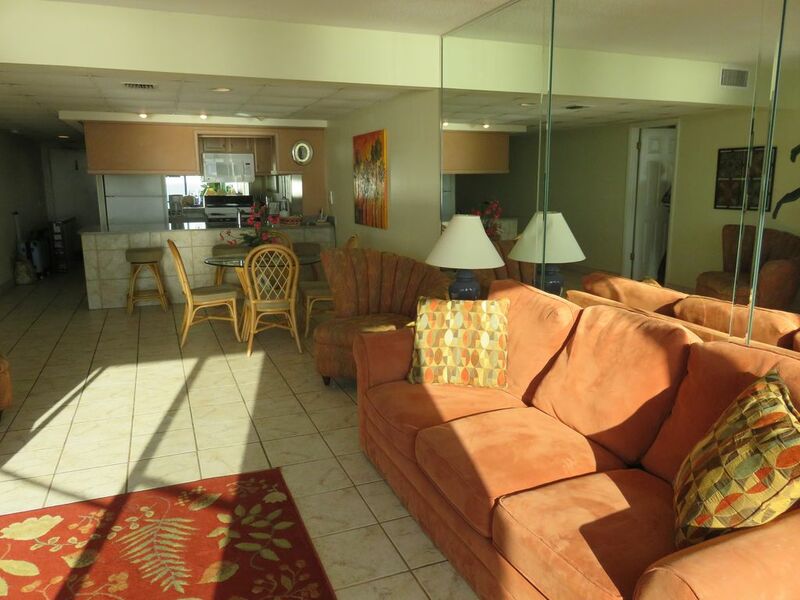 Great on-site security, restaurant on-site, golf course, several pools, Gulf front. Edgewater has more amenities than any other properties along the beach. Fitness room, 9 hole Par 3 golf course (private for owners and guests only), Oceans Restaurant and more! Balcony for unbelievable Sunsets. Be sure to watch for the dolphins swimming West to East in the morning. Sunsets watch for the Green Glow. A rare and awesome site! Water,Water,Water Everywhere. White Sugar Sand between the toes. Seashells for picking. Just steps from the condo. Water sports, fishing, swimming, tennis, golf, Oh My! All linens provided. We ask that you bring your beach towels with you. Parking close to condo entrance. No need to walk any distance or cross a street. Towels, hand towels provided. Private unit so towel exchange is not available. On grounds for small fee. Ocean view with patio door onto balcony. TV and free internet. Fully equipped kitchen w/full size appliances. Updated kitchen. Everything you will need. Read some, take some, leave some. A variety are always there. Private balcony for ocean views, sunrise and sunsets. Relax to sound of waves while having that morning coffee or that sunset cocktail/wine. Available off site for rent. Rentals available in the area. Rentals available on the beach! On grounds for small fee. 10 Plexicushion courts. On grounds for small fee. Private 9 hole Par 3 for use of only owner's and their guests. 11 pools including Edgewater's 12,000 square foot Polynesian-style Lagoon Pool with waterfalls and lush landscaping. Pools are heated in winter except Lagoon pool. Kids splash area. Total resort concept. You do not need to leave. Or, can access all nearby restaurants, attractions, golf, etc nearby. Resort features hair salon, snack shop with gifts and necessities, Starbucks Coffee in snack shop, 9 hole Par 3 golf course private for owner's and guests, 10 pools featuring a large lagoon pool, kids water splash area, Sky Trail ( a mini climbing/zip line), hot tubs, Oceans Restaurant with indoor and outdoor dining, specialty drinks and Great Food!